Various defense pundits, scholars, and journalists have spent a considerable amount of digital ink debating the various threats to America's carrier fleet while avoiding a more central question. Clausewitz tells us, "war is the continuation of politics by other means." Is there any political situation of such gravity that losing a carrier would be deemed an acceptable risk? In other words, how expendable are carriers? The answer to this question has large implications for the tactical and strategic options available to U.S. policymakers. "The nature of forces engaged in maritime operations…are expensive, hard to replace, and even the smallest units represent a sizeable investment in human resources, whose loss can be sudden and instantaneous and very hard for publics and governments to bear." To those who doubt such a scenario will ever unfold, consider this: Nothing is ever truly invulnerable. The sinking of the Titanic and the Bismarck as well as the passing of the "Battleship" era can all attest to that. Consider the various threats from Beijing's A2/AD missile arsenal, specifically the DF-21D anti-ship ballistic missile (ASBM) and YJ-12 anti-ship cruise missile (ASCM). The International Institute for Strategic Studies' 2013 global defense assessment, The Military Balance, states that the DF-21D has gone through limited testing and has been deployed to the Second Artillery, the branch of China's military that controls its nuclear and conventional missile arsenal. Managing Editor for The National Interest Harry Kazianis brings up the point that simple math weights in the favor of the attacker when it comes to anti-ship weapons like the DF-21D. The U.S. Navy has a total of 30 ships equipped with the state-of-the-art Aegis Ballistic Missile Defense (BMD) system. Even if Washington utilized every Aegis BMD-equipped ship from across the globe, there is a limited amount of interceptors America could bring to the fight. American ships would be sitting ducks once they ran out. Worse, thousands of such missiles can be expended and not even come close to approaching the cost required to field a fleet capable of taking on the U.S. Navy. The threat of a full carrier-strike group anchoring offshore has always been a cornerstone of U.S. deterrence. The sinking of a U.S. aircraft carrier--possibly by A2/AD style weapons--would likely be the defining moment where the era of perceived U.S. global military dominance would come to an end. Such an event--greatly magnified by a 24-hour global news cycle and the rise of social media--would alter the entire globe's political and strategic balance. Any regime seeking to carve out local spheres of interest would scramble to seek the means to fend off the U.S. Navy. 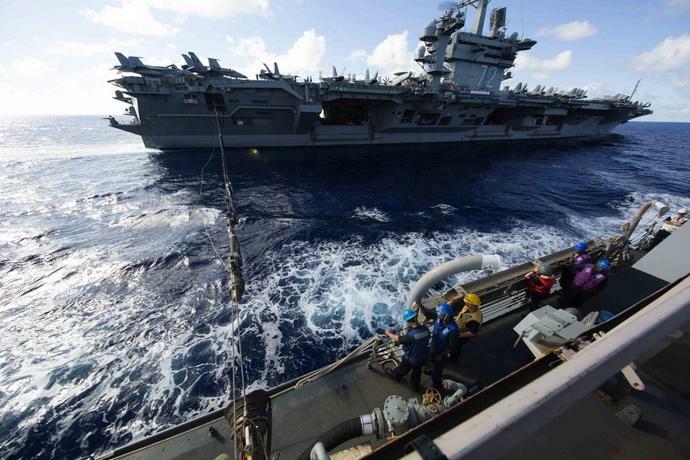 After all, the U.S. Navy is the single most important force providing security for the globalized economic system. Clearly American security assurances wouldn't carry as much weight with a carrier sitting at the bottom of the sea. If the Navy's worst nightmare came true and U.S. adversaries strengthen their ability to threaten aircraft carriers, how does the Navy reorganize itself to project power? The entire concept of a carrier strike group (CSG) is based on putting bombs on target by primarily carrier-based planes. This is a large part of the Navy's new operational concept, Air-Sea Battle. Air-Sea Battle (ASB) integrates forces from all domains: space, air, land, sea, and cyber, in order to defeat "adversaries equipped with sophisticated anti-access and area denial capabilities." An asymmetric weapon that can bypass a carrier's layered defenses and have even a remote chance at hitting a carrier would throw a wrench in a plan that may be costing U.S. taxpayers around half a trillion dollars. "Big, expensive, vulnerable - and surprisingly irrelevant to the conflicts of the time…The national security establishment, the White House, the Department of Defense and Congress persist despite clear evidence that the carrier equipped with manned strike aircraft is an increasingly expensive way to deliver firepower and that carriers themselves may not be able to move close enough to targets to operate effectively or survive in an era of satellite imagery and long-range precision strike missiles." There is a considerable amount of inertia behind the carrier program in the United States. In a recent article about China's DF-21D Time magazine quoted retired Navy Captain naval-strategist Bernard Cole explaining how our Navy, domestic industry, and politicians all have a deep-rooted interest in keeping carriers as the centerpiece of our naval strategy. Indeed, these behemoths have accompanied us during the entirety of our rise to military preeminence. However, our close relationship with the carrier has its drawbacks. Historically, one advantage that developing militaries have is that they get to base their doctrine and fighting methods on current technology in the relative absence of entrenched interests. Conversely, consider the damage that obsolete ideas of warfare wrought during the beginning of World War One. Hundreds of thousands of soldiers died before the major European militaries were able to shed themselves of their dogmatic doctrine and antiquated leadership. If aircraft carriers are being eclipsed by various A2/AD weapons systems and asymmetric strategies, the military-industrial inertia behind the carrier program is a strategic disadvantage to the United States. "Go back to a situation in terms of risk that much more resembles the Cold War than the past two decades. So risk will go up, but we've dealt with risk before. We are just unused to deal with that type of risk in recent experience. It will be a learning process on our side to develop the appropriate ways to respond."